On the beach, you need a watch that can stand up to wind and water, a rubber or canvas strap, and a colourful appearance. Several brands have issued some pieces that fit the bill. Here is a selection in increasing price order. 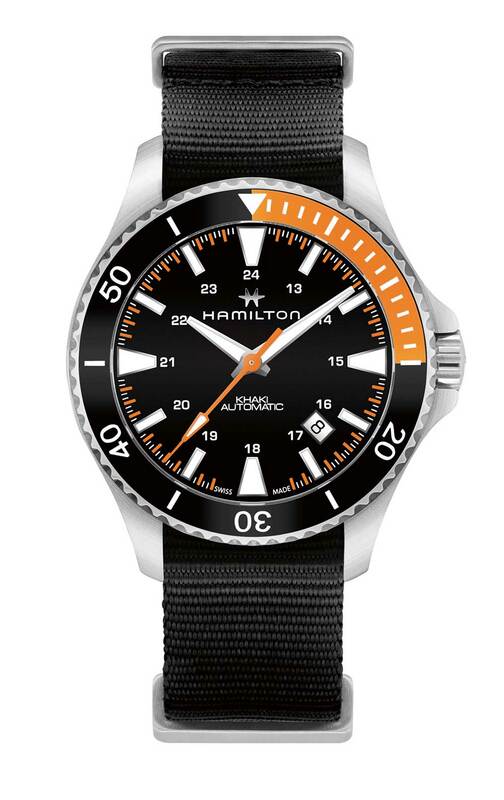 The Hamilton Khaki Navy Scuba looks like a diving watch, with unidirectional rotating bezel and screw-down crown, but its water resistance of 10 bar/100 metres makes it suitable at most for surface swimming. It is moderately sized at 40 mm diameter, with a steel case. The self-winding ETA Powermatic 80, ETA CO7.111, provides 80 hours power reserve. The version with black and orange dial and a NATO strap, reference H82305131, costs €645. Read more here. Youthful, chunky, trendy. This new TAG Heuer Aquaracer Calibre 5 was built for young people and launched in perfect time for the 2017 summer season. Its characteristics, with a 300 metre water resistance, make it a classic diving watch but it is very much a sports watch in its looks – perfect for the beach. The case is 43 mm in diameter, in titanium, with a unidirectional bezel. 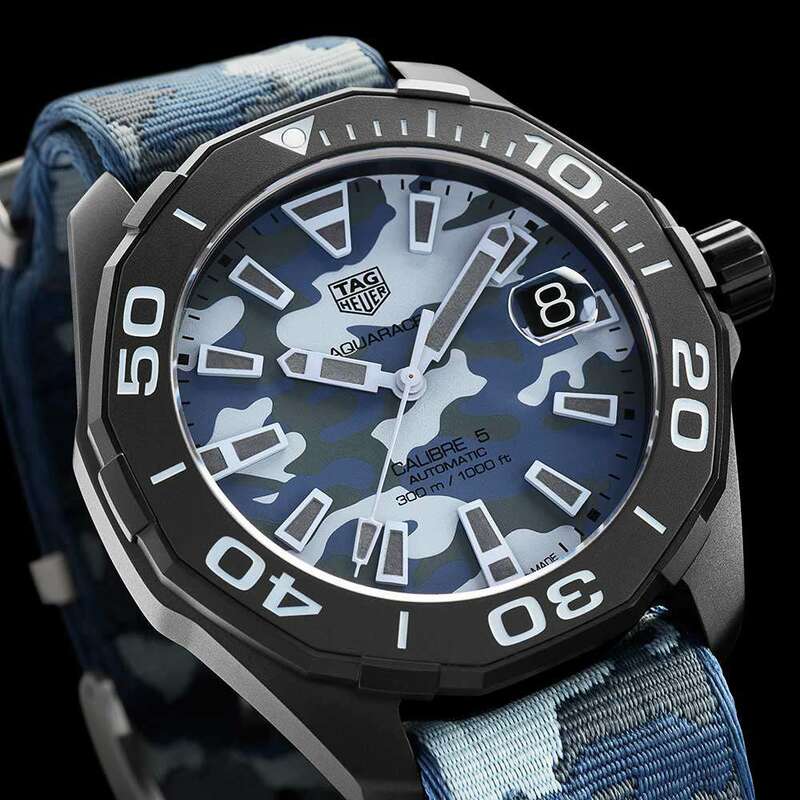 The TAG Heuer Aquaracer 300M costs €2,500. Read more here. The Scafograf GMT has some sports watch features, such as a 100 metre water resistance, luminous hands and rubber strap. Instead of the unidirectional diver’s bezel, it has a 24-hour bi-directional bezel and a GMT hour hand. The case is generously-sized at 43 mm diameter, and it’s fairly slim at 11.8 mm thickness. The watch is powered by the self-winding ETA 2893-2 calibre. 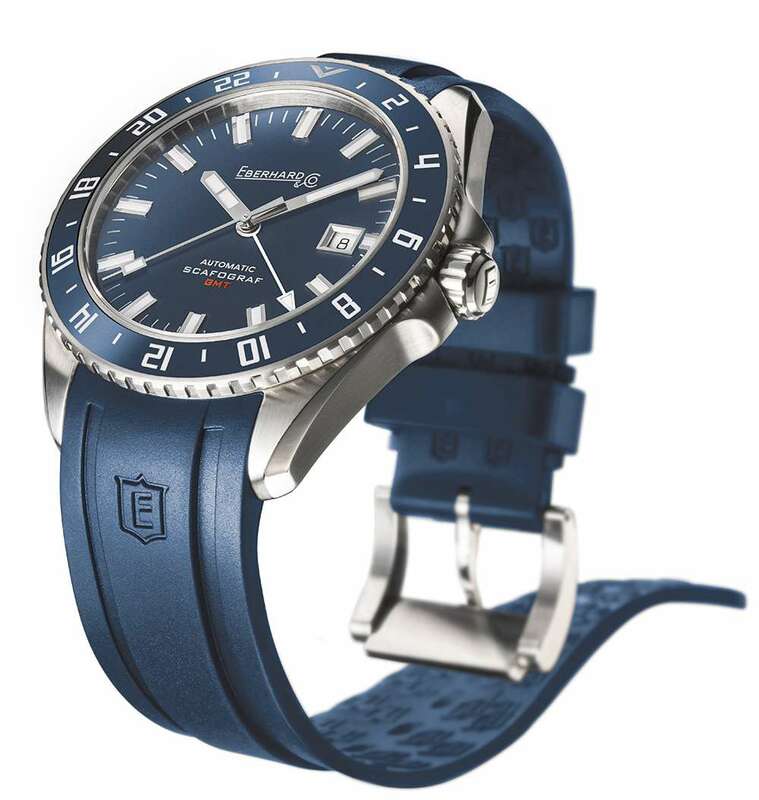 The Scafograf GMT by Eberhard & Co. with rubber strap costs €2,940. Read more here. The Ahoi series has some trendy new colours, and 200 metres water resistance that makes them perfect for the beach. Case sizes are 36.3 mm or 40.3 mm, so unisex or men’s respectively. 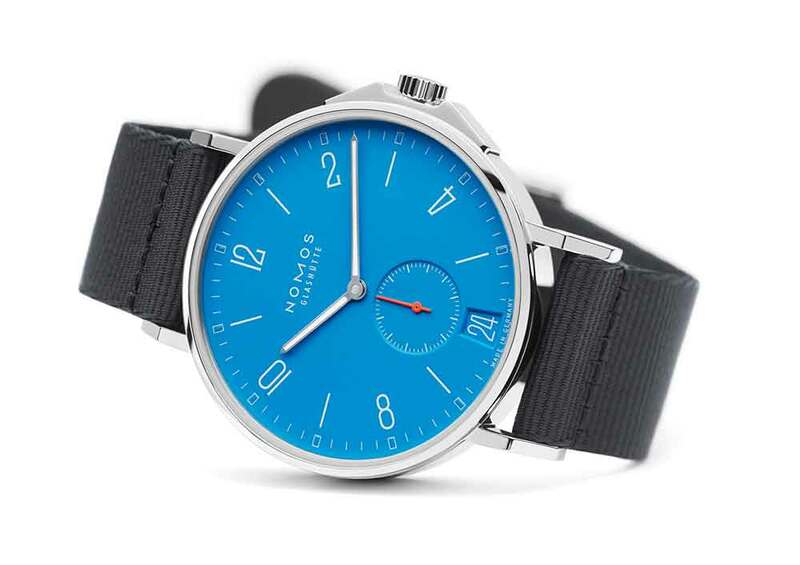 The Ahoi neomatic is powered by the NOMOS DUW 3001 movement, visible through the sapphire caseback, designed and built in-house. The 16 models in the range have a textile strap in blue-black or light grey, made in France. They have a coarser, tougher weave outside, and a finer weave inside for comfort. They dry very quickly after contact with water. The version shown costs €3,620. Read more here. 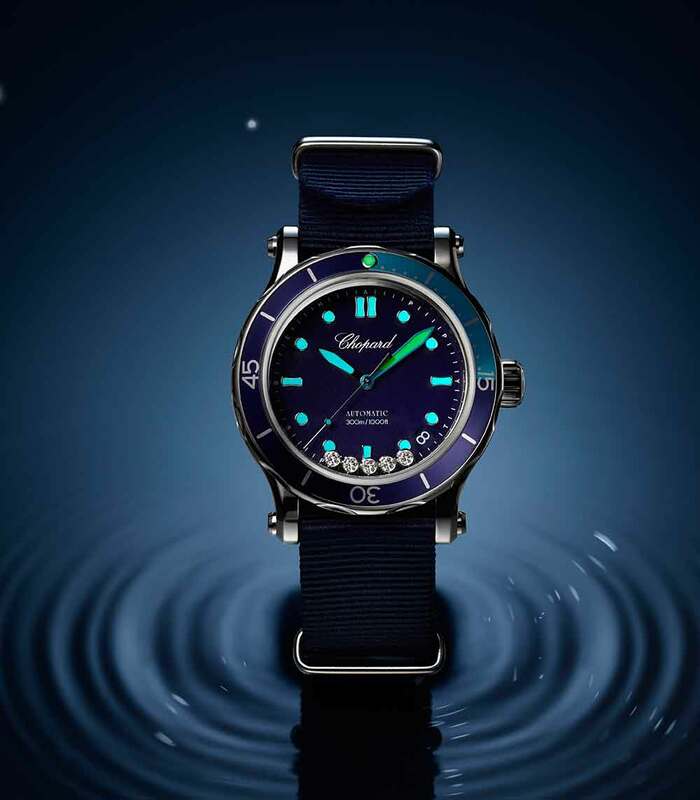 This year, Chopard introduced its Happy Ocean collection, that extends the existing Happy Sport range. It has an impressive 300 metre water resistance (100 metres in the gemset version), but at the same time it has the mobile diamonds on the dial that hallmark the brand’s “Happy” watches. Happy Ocean has a large 40 mm steel case, 14.21 mm thick, with two-tone unidirectional rotating bezel in anodized aluminium, intense blue dial, and a minute hand edged with the same colour as the first fifteen minutes on the bezel. At night the watch reveals another touch of quirky humour, with SuperLuminova creating jewels of light, green-emitting on the minute hand and bezel reference dot, and blue-emitting for the hour hand and hour markers. Straps are in turquoise or raspberry rubber, designed to stand up to sand and seawater. A navy blue NATO strap is also provided with each watch. The version shown costs €7,690, $8,780, 7,800 Swiss francs. Read more here. 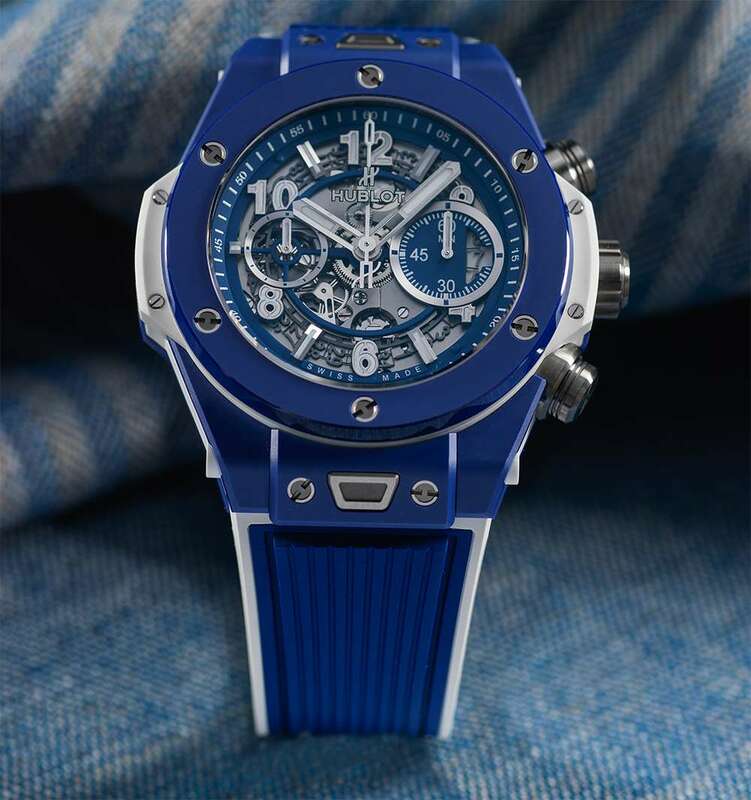 The Hublot Big Bang Blue is a new version of the brand’s Big Bang flyback chronograph, with a skeletonized dial and all the classic Hublot features such as the H-type spline screws in titanium, and the Unico movement. It’s a large watch at 45 mm diameter, 16.3 mm thickness, and its water resistance of 10 atm (100 metres) makes it perfect for the beach where it will stand up to water splashes and even light surface swimming. Price 20,400 Swiss francs, €21,200. Read more here. This quirky and attractive watch will be a star on any beach, day or night. 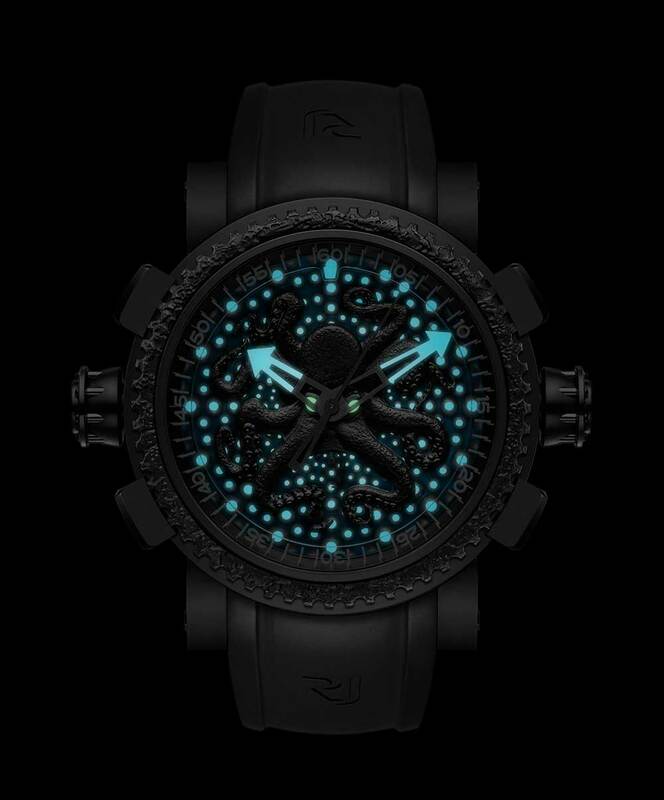 The Octopus Lume is a 25-piece limited edition, with a 47 mm case in black PVD-coated steel that contains a minimal part of steel from the Titanic. The octopus appears on the dial, and it also features on the caseback and on the 3 o’clock crown. The black rubber strap has a pattern of miniature suction caps inside, recalling an octopus’ legs. The blue-emission SuperLuminova gives the piece a second life, with a totally different character in the dark. The brass dial base was textured, rhodium-plated and then coated in transparent blue resin. A series of cavities, like those of a sea urchin, are filled with SuperLuminova. The result is a witty piece with unique character. It is a limited edition of 25 pieces, price 19,950 Swiss francs, €21,950, £18,500, $20,950. Read more here. 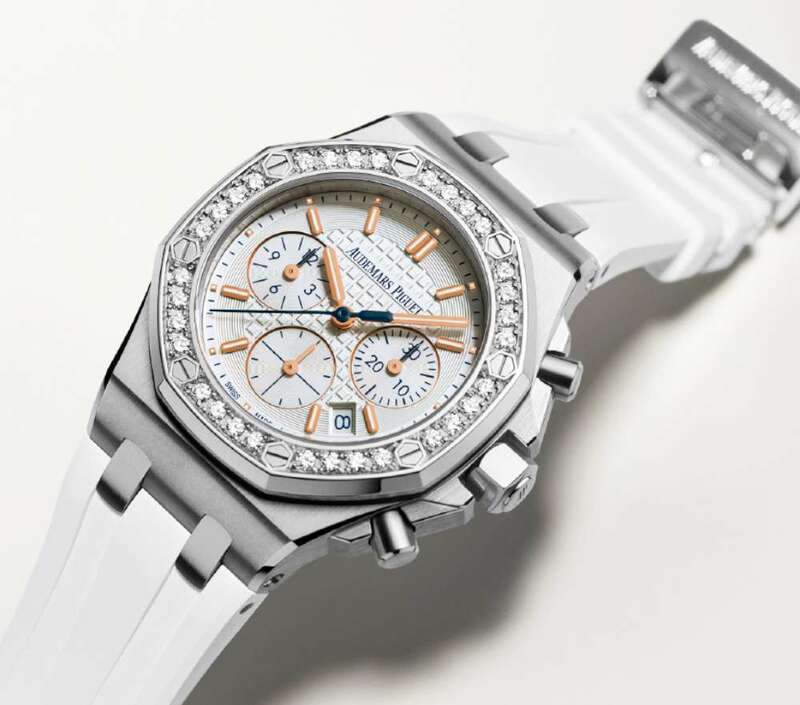 Audemars Piguet makes expensive watches and in some of their recent releases have enjoyed themselves in giving them a sportier, younger, trendier appearance. The Audemars Piguet Chronograph Summer Edition 2017 for women is a good example. It costs almost €30,000, but it looks like a watch for the beach, with its white rubber strap, jaunty steel case and diamond-set bezel. The case is 37 mm in diameter, with 32 brilliant-cut diamonds (about 1 carat total). The crown is screw-down, which helps give the watch a water resistance rating of 50 metres. Enough to protect it from a few splashes. The watch is supplied with the white rubber strap shown in the photos, with steel folding clasp. The box includes an extra blue rubber strap. It costs €29,900. Read more here.